The abbey was founded in 1172 by John, constable of Chester, and was colonised by a group of monks from Combermere. The original site was at Stanlaw, on the Mersey estuary in the Wirral. The area was dominated by a desolate marshland, susceptible to flooding, and after a century the community finally had enough. The monks appealed to their patron, Henry de Lacy, for a new plot of land and petitioned the pope for permission to move to a better site. In 1296 all but six of the monks moved to Whalley. The new site had its own problems. It seems Whalley was too close to Sawley Abbey and the two communities were soon engaged in a bitter dispute. Building materials were also hard to come by and the construction of the abbey progressed at an extremely slow pace. In 1316 the monks were considering another move. However, the community finally chose to stay at Whalley and started work on the church and permanent buildings. Throughout most of the fourteenth and fifteenth centuries there were around twenty and thirty monks residing at the monastery. In late Tudor times the house seems to have been relatively prosperous and spent an extravagant two-thirds of its annual income on purchasing foodstuffs and drink. 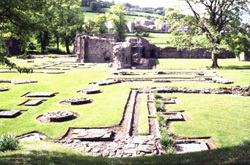 John Paslew, last abbot of Whalley, was also responsible for the commissioning of a separate mansion, east of the great cloister. In 1535 the net annual income of the abbey was valued at £321 and thus the community should not have been suppressed until 1538/9 when the larger monasteries were required to surrender. However, in 1536 the last abbot, John Paslew, was implicated in the Pilgrimage of Grace. The king’s troops were sent to Whalley to deal with the rebellious monks: Paslew and two other monks were tried at Lancaster and were executed at Whalley in March 1537. Whalley was seized by the Crown and remained in royal hands until 1553, when the site was sold to John Braddyll (the former abbey bailiff) and Richard Assheton. Assheton took the monastic buildings and converted the infirmary and the abbots house into a country mansion. The church and the south range of the cloister were later demolished by one of his descendents. In 1923 the western range was bought by the Catholic Church and the rest was acquired by the Anglican diocese authorities of Manchester (now owned by the diocese of Blackburn) to be used as a conference house. The ruins of the cloister and abbots house are owned by the diocese of Blackburn and are open to the public at all reasonable times. The gatehouse chapel is now managed by English Heritage and is also accessible to the public. The western range now contains a chapel belonging to the Catholic Church.